Happy Valentine's Day! Valentine's Day has put me in such a good mood that I decided to post something. I know a lot of people hate this holiday for a lot of boring reasons, but I've always liked it. It's a good excuse to be a little flirtier than usual, and even during the years where I didn't have a valentine, I always liked pampering myself. Poncho isn't big on Valentine's Day, which is fine so long as he's not being an absolute turd about it (which he isn't), so I always get myself a treat for the holiday. This year I made myself fruit salsa, with cuteness as an extra ingredient. Bonus: It's almost healthy! Almost. Slice the apples and strawberries so that you can press lots of heart shapes. Toss the hearts into the bowl. Chop the leftover apples and strawberries smaller than the hearts (big chunks will distract from the cute shapes) and toss that in the bowl. 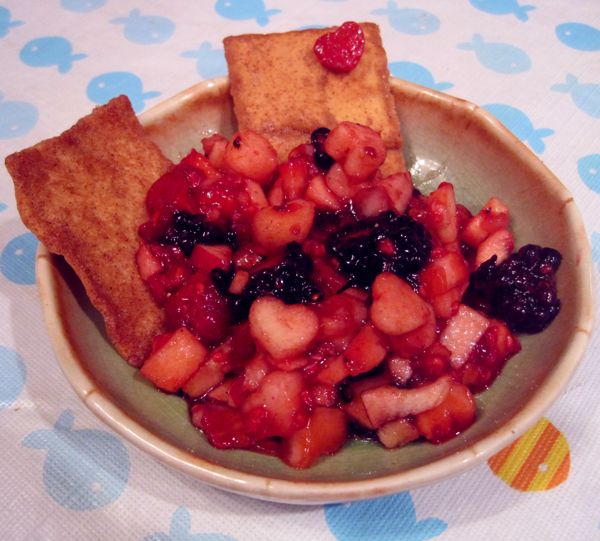 Roughly chop up the raspberries and blackberries (and any other fruit you want; kiwi and crushes pineapple are popular additions) into kind of a mushy consistency and toss those in the bowl too. Add the preserves and sugars. Mix it all up. Serve cold with the pita chips for dipping. Found you on 20sb. Nice to meet you! Looking forward to future posts! Yum! Looks delighting and tasty.